Vitality Farms had an interest in restoring the riparian forest along the Marys River on their 150 acre farm as part of their transition plan to achieving organic certification. Working with the Watershed Council and OSU Students from the GEO300 class between 2010 and 2012, native trees were planted on 3.35 acres along .6 miles of the Marys River. The GEO300 classes have returned each year to assist with maintenance to control competing vegetation. The farm utilized goats and sheep to initially remove aggressive blackberry that dominated the stream banks. The work of the browsers was then followed up with a brush mower and excavator to knock back woody canes and dig out corms. 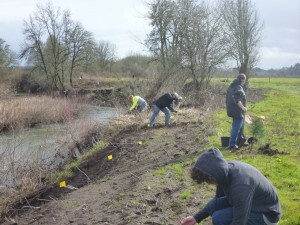 This project was supported by Oregon Watershed Enhancement Board, Vitality Farms and OSU Student volunteers.